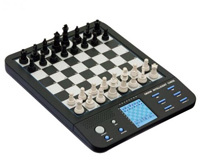 This handsome portable Chess Computer provides endless entertainment at home or on the road. This is a beginner chess computer and is perfect for people, young and old, who are learning how to play chess. Playing against a chess computer is a great way to learn how to play solid chess. Practice your openings, middle and end games by either playing the Computer, or doing any of the practice puzzles. Features: 100 Pre-set Chess Exercises for practice, a Pressure sensative chess board and LCD Display. Includes multiple skill levels with different time controls. This beginner chess computer is perfect for young and old who are currently interested in learning how to play chess. This computer is a great choice for learning how to play solid chess, with tons of practice puzzles and games for you to become a professional chess player. 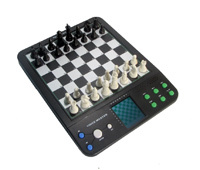 DGT electronic chess boards are very accurate and include fast chess move input devices for your computer. USB e-Boards are great for use at school, home, or club. Simple to use by Connecting a single board to the PC with USB cable. The board is supplied with all accessories in a nice gift box. The set measures21" x 21" with 2-1/8" squares and a king that measures 3-3/4" •Board Thickness: 3/4"
DGT electronic chess boards are accurate, fast, and include input devices for your computer. Perfect for tournament use, home use, or club. USB e-Boards are easy to use. connect of a PC with USB cable and get ready for fun!. The boards include all accessories in a nice gift box. This is a 21-1/4" x 21-1/4" with 2-1/8".